Band of Brothers is based on the real life events of the soldiers in Easy Company which was a part of the 2nd Battalion, 506th Parachute Infantry Regiment. This television series tells of the exploits and experiences of the E Company during their assignment with 101st Airborne Division of the United States Army during World War II. Although the series is generally based from the book Band of Brothers (which was written by historian Stephen E. Ambrose) to keep it historically accurate other sources including unpublished diary entries and other paratrooper memoirs were also referenced. The series is based on the physical and mental strains placed upon the Battalion and one man's struggle to keep his troop together throughout all the adversities. The major focus revolves around Major Richard Winter and the experiences and turmoil that he and his company faced. As each real life event unfolds in the series the outcome is the same for the soldier that the character was based after. The series beginnings in Georgia at Camp Toccoa with jump training. The series also includes the actions that occurred from the landing at Normandy, Operation Market Garden and the Siege of Bastogne. The highlights feature the taking of eagle's Nest and the capitulation of Japan at the end. This television series was directed by Tom Hanks and Steven Spielberg with consultations and input from surviving Easy Company veterans Richard Winters, Amos Taylor, Frank Perconte, Ed Heffron and Bill Guarnere. The cast of characters and actors include Damian Lewis as Major Winter, Ron Livingston as Captain Nixon, Matthew Settle as Captain Speirs and Donnie Walberg as Sergeant Lipton to name just a few. Easy enters Berchtesgaden, to capture the "Eagle's Nest", a mountain mansion that was built by the Nazi party for Hitler. After going to the mansion and taking many of Hitler's belongings, the men are given some down time. With Hitler having commited suicide the war in Europe is over. The men of Easy celebrate, but soon they are told that all of the members without enough points to go home will be sent Japan. Easy finally gets into Germany and is met with little resistance. While on a patrol, the members of Easy discover and abandonned concentration camp. The German guards have left, but all the prisoners are still in the camp. Easy is in a town called Haguenau, near the German border. Winters is ordered to send a group of men across the river on a nighttime raid to take German prisoners. Lt. Dike has been put in charge of Easy Company, but he is a terrible leader. He is constantly leaving the frontline and going off to random places whenever he is needed. The soldiers begin to wonder if he will be able to lead them when they are told they will have to take the nearby town of Foy. Easy Company is in the forest just outside of Bastogne, Belgium. The company fights off frostbite, hunger and the occasional German attack. Medic Eugene Roe meets a Belgian nurse who he becomes friends with while trying to keep the men of Easy Company alive. A group of replacement paratroopers join Easy Company just before the company is set to jump into Holland for Operation Market Garden. When Easy gets to Eindhoven, they meet no resistance, instead meeting locals who are happy to see them. But when they are patrolling a nearby town, they are ambushed and "Bull" is left behind. After finally regrouping in Angoville-au-Plain, Easy Company is sent to take the town of Carentan, which is essential so that the United States can bring its tanks off the beaches. After struggling to take the city, the men of Easy Company along with several others are forced to prepare for the imminent German counterattack. The members of the 101st Airborne are in training at Camp Toccoa, Georgia. After finishing their training, the men ship out to Uppottery, England. They practice their jumps, do field exercises, and find out that their first combat experience will be Normandy. 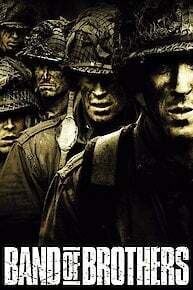 Band of Brothers is currently available to watch and stream on HBO. You can also buy, rent Band of Brothers on demand at Amazon Prime, Amazon, Hulu, HBO GO, HBO NOW, Vudu, FandangoNow, Google Play, DIRECTV NOW, iTunes online.